A Rolls-Royce limousine is a popular limo rental. This classy vintage vehicle magically transforms a predictable wedding celebration into a modern fairytale. With a few helpful tips for renting a Rolls-Royce limousine you can save time and money. For nearly a century, Rolls Royce vehicles have been the epitome of class, distinction, sophistication, and luxury. Popular with wealthy automotive aficionados including the British royalty, these cars with their seductive curvy lines and graceful detailing are a perfect choice for an elegant wedding. Models from the 1930s, 1950s, and 1960s are particularly popular for vintage limousine rentals, typically in white or two-toned white hues as well as convertibles. With names like Phantom, Silver Wraith, Silver Cloud, and Silver Shadow, even the specific models of Rolls Royce cars conjure images of wealth, prestige, and luxury - characteristics that match well with the elegance of a wedding. Why Choose a Rolls Royce Limousine Rental? There are many types of limousines available for couples to rent on their special days, including specialty buses, Hummer limousines, and classic black stretch limousines. Why, then, should a couple opt for a Rolls Royce? First of all, the name Rolls Royce is the most recognizable car model in the world associated with posh elegance. The exquisite hand detailing on each vehicle, rich wood and leather interiors, and superior engine performance makes Rolls Royce cars instantly noticeable and far more unique than a standard black or white limousine. Furthermore, the opposing door construction of most Rolls Royce models can offer the couple graceful access to the vehicle that will not cramp or crush even the most voluminous wedding gown. The highly trained chauffeurs in vintage attire to match the car helps create a fantasy tableau perfect for a fairy tale wedding, and the car's association with royalty is sure to make every bride feel like a princess. A Rolls Royce limousine rental is particularly suitable for formal affairs or weddings with an antique, vintage ambiance. Superstitious brides may opt for a classic Rolls Royce as the "something old" in their bridal regalia, or choosing this type of vintage car may be a sentimental connection to a grandparents' or great grandparents' wedding day. Rolls Royce limousines are understandably rarer than their modern counterparts, and they can be more difficult to locate. Most major metropolitan areas have several limousine services that may feature vintage Rolls Royce cars, or couples may need to hire a car from a more distant location. Rental rates are somewhat higher than for more commonplace limousines, but at $150 to $300 per hour, the price is comparable to other specialty limousines. To help trim the cost, the couple may consider shortening the rental period, just using the vehicle as a getaway car or to transfer between the wedding ceremony and reception locations, or skipping pricey extras such as champagne, flowers, or other unnecessary amenities. When choosing a Rolls Royce limousine, also be sure to investigate the exact vehicle being rented. Double check the quality of the restoration including exterior and interior details, the overall cleanliness of the car, and the consistency of the paint job. Small imperfections that may go unnoticed when signing a binding contract can become glaringly obvious on the wedding day. 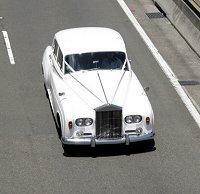 A Rolls Royce may be a luxurious vehicle, but there are differences between these vintage cars and modern limousines. Most Rolls Royce models are less spacious than modern vehicles, and while they can comfortably seat the happy couple and perhaps their parents or closes attendants, the entire bridal party is not likely to fit in a classic Rolls Royce. Furthermore, because they are restored antique vehicles, Rolls Royce limousines do not typically feature the extravagant amenities in the limousine that more modern cars offer. A Rolls Royce is likely to have a CD player and interior light dimmer switches, but there will not be a television set, DVD player, or mini-bar. The extraordinary elegance of a Rolls Royce limousine rental can turn any wedding into an elegant event and make the happy couple feel like royalty. From the recognizable luxury of the car to the subtle elegance of its interior and performance, there is no better way to cruise into a new life together than in a Rolls Royce.